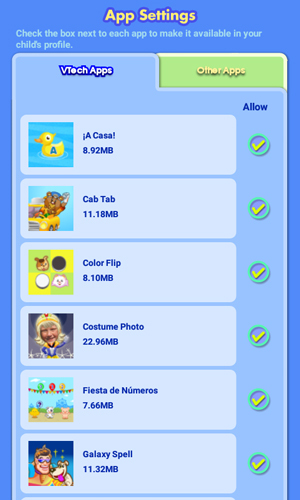 By default, apps you download from the Amazon Appstore are not accessible to your child. Follow the instructions in this tutorial if you wish to make them accessible. Touch the App Settings icon. You'll see two tabs within App Settings. The VTech games that came with your KidiBuzz™ plus any games you've downloaded from Learning Lodge® are all listed under the "VTech Apps" tab. Any content you've downloaded from the Amazon Appstore will be listed under the "Other Apps" tab. Touch the "Other Apps" tab. Then touch the check box next to any apps you want to give your child permission to use in their profile. 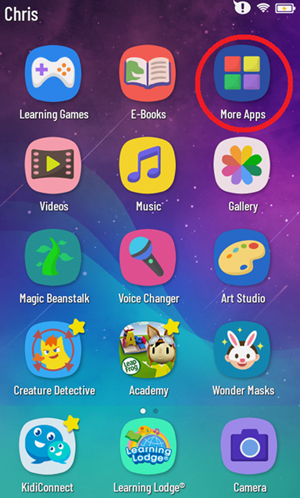 To access an app from the Amazon Appstore in your child's profile, select "More Apps" from the child's Home screen. Then, select the app on the next screen. If you change your mind and want to remove access to an app later on, just repeat the steps above to go back into App Settings and uncheck the box next to the app you wish to remove.